Dry roast the rava well.Make sure that u dont burn it.A nice aroma will come if its completely roasted.Keep aside. Take remaining ghee in a pan and fry the cashews and raisins and keep this also aside. In a heavy bottomed pan,Take required amount of water. (its in the ratio rava:sugar:water=1:2:3).Bring it to boil.Then add a pinch of salt and the food color and stir well.Then add in the roasted rava little by little and keep stirring. Make sure that there are no lumps formed.Then add in the sugar.Here also no lumps should be formed. 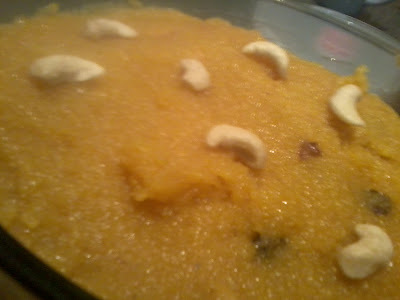 Keep stiring on low flame.Then add in the roasted cashews and raisins.If you dont want to get hard solidified kesari,turn off flame when its lil watery.